It’s the holidays and time for some cheer! So after the travel and tree comes one of the best parts of the holiday: Christmas by the Sea. Whether you are a Santa fan or only hum-hum about eggnog – the weekend is highlighted by caroling and good ol’ fashion Yuletide. Pack your appetite. Local restaurants serve up their best chowder, chocolate and more, along with beer and wine tastings, to share the best of Ogunquit’s holiday cuisine. And local residents put their best tree décor forward for the Giving Tree Silent Auction. You never know – you may get really lucky with the lottery tree! Of course we all know that feeling – When the only person left on your list is impossible to buy for. Here in Maine, that inspires us to make crafts and art. So check out the locally Maine made crafts in the Dunaway basement or check out the amazing art sale at Gypsy Sweethearts. With jewelry, wreathes, knitting and more, you are sure to check off that list, maybe even twice. Put on your swimsuit and take the Polar Plunge. Held on Ogunquit Beach, a quick dip in the ocean benefits Toys for Tots And if you stick around, Ogunquit Holiday parade will kick off in Perkins Cove and heads towards Main Beach. High steppin’ in your holiday finest! Shopping in Ogunquit and Kittery is always special with unique items in the boutique stores and oodles of outlet deals. But for Christmas more than 125 stores in the Kittery Outlets offer amazing sales. You’ll discover we have special coupon vouchers for our guests, plus you can stop into Robert’s for a real Maine Moxy. The Kittery Outlets make for wonderful treasures under the Christmas tree. Wanna have your kid have the best holiday story in class? That’s easy. Check out Christmas by the Sea Bonfire and Fireworks. Head on to Ogunquit Beach with layers of Maine flannel and hot cocoa to get the best seat. Still not sure about Christmas in Maine? Add a little extra fun with a walk along Marginal Way to work up – or off – your holiday eggnog. Or take a drive to the top of Mt. A to see the stunning view. Be sure to bring your camera. There really is nothing as wonderful as spending quality time together in Maine for the holidays. 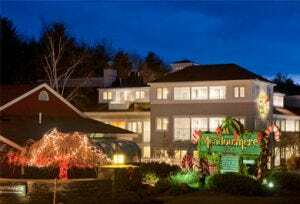 If you’re thinking of visiting our Ogunquit hotel to enjoy a cozy cocktail by the pub fireplace or head to Maine for the holiday, check out our Christmas by the Sea package and great hotel room choices with a central location.